Bose AE2w review | What Hi-Fi? 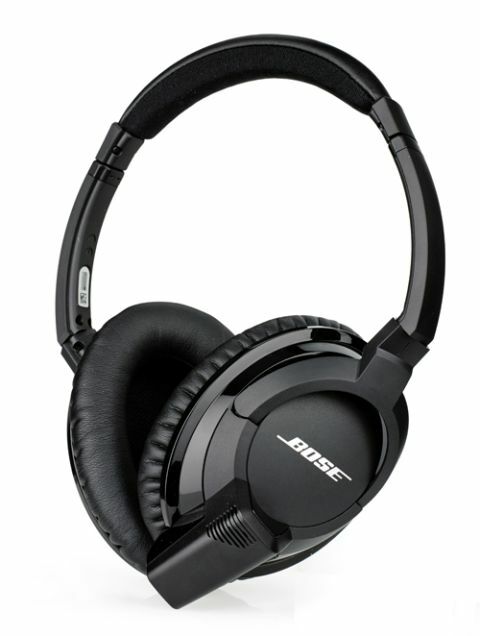 The Bluetooth spec of the Bose AE2w headphones make these wireless cans great travel partners. Their basic looks might not do wonders for your street cred, but on the plus side at least they’re not ostentatiously nickable. The AE2ws come in black, and have a nice thin, flexible headband. But what struck us when unboxing them was the removable control module needed to make a Bluetooth connection. It connects via the 3.5mm jack, which sticks out like a sore thumb from underneath the left ear-cup. The jack is something to lose when it isn’t attached and doesn’t make the headphones as compact as their competition. Having internal wireless electronics is demonstrably do-able, so why not do it? The earcups do fold flat, however, and fit nicely in the supplied black drawstring bag. A USB charger cable and a 3.5mm audio cable complete the package. What AE2ws do well is comfort, and there have been no compromises here. We put them on and they felt sturdy but light on our heads. The soft leather ear pads – similar to the Award-winning Bose QuietComfort 15s – completely envelop your ears, giving them plenty of space inside and blocking out external sound too. Even though there’s no active noise-cancelling on board, they had no problems isolating us from room or crowd noise. All controls are on the module, so everything is at least tidily in one place – and pairing is as simple as holding down the volume-up and multifunction buttons. The latter also controls playback – press it once to play/pause, twice to skip forward and three times to skip back. We found the controls efficient up to this point, but three presses felt a little finicky. The multifunction button also controls hands-free calling. Voices sounded loud and clear when strolling roadside, but note that they leak sound quite a lot – not great if you want to keep your conversations private. Bose says the AE2ws’ playback time is seven hours, which feels somewhat stingy compared with the ten-hour par. The 10m wireless range seems adequate, however, and we like the headphones’ ability to simultaneously connect to two devices simultaneously. There’s no higher-quality aptX Bluetooth on board, but the standard Bluetooth connection doesn’t appear to compromise the AE2ws’ sound. It’s actually very listenable. They produce a strikingly spacious and open sound with plenty of detail and body. Though it’s less direct than the Philips M1BTs, there’s a clarity and finesse in the vocals that was able to draw out the vulnerability and intimacy in Pilot Speed’s Alright before crashing with impact into an electric guitar riff. Dynamics are present and forthright, though noticeably had less of a spring in their step than the sprightly sound of the Philips cans. Nevertheless, their mellower manner is miles away from sounding tired. Although impressively smooth in the midrange, their composure wobbles at either end of the spectrum; the bass is a little boomier than we’d like and the treble feels hard. That doesn’t make these headphones undesirable, though. They might not be as consistent across the frequency spectrum as the front-runners – or as good-looking – but they still produce an excellent sound and are supremely comfortable. To fulfil their purpose as the perfect travel companion, Bluetooth headphones have a lot of boxes to tick, and Bose has done well to achieve most of them on its first time round.